The South Lancashire Motorway, M52. It's the answer to a small mystery. Stop messing about! What are you on about now? OK, two small mysteries, really. Firstly, why the M62 is west of the M6, when surely it should have a number beginning with "5". Secondly, why the M62 suddenly turns the corner west of Manchester, whilst the M602 continues on. I'm waiting with baited breath here. No need to be sarcastic! Well, I'm getting fed up waiting for you to get on with things! Anyway - the reason both of the above happen, is all down to the original plans for the motorways to the west of Manchester. The M62 was supposed to go around the west of Manchester and Salford, then head around the north of the two cities and off to Yorkshire. 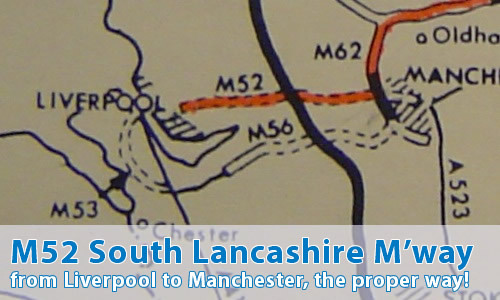 The M52 was supposed to link Liverpool and Manchester/Salford, using the present M62/M602 combination. However, some bright spark decided in the late 1960s to make the M62 go pretty much all of the way across the country, so everything changed. And, of course, the western section of the M52 has never been completed. Ah yes, that would be the bit in towards Liverpool, wouldn't it? Have you got any documentation that shows the M52? Yes, here's a section from some 1960s MoT documentation describing the M52. OK, here's one from the 1960s showing a section of the planned national Trunk motorway network in the South Lancashire and North Cheshire area. I think they should rename the M62 west of Manchester as the M52 as it was originally intended to be, in order to eliminate the stupid situation of two M62s that exists now the M60 has taken the middle bit. A lot of people say its mad having 2 M62s now that the M60 is orbital but it makes more sense to have one number all the way around plus it gives the opportunity to revoke an old number for the western section of the M62; namely call it the M52 and have done with it! A couple of people have commented that the M62 has been split up by the M60 ring road. While this is technically true it is worth pointing out that the M60 was numbered so that the former M62 junction numbers would line up with the (now) M60 junction numbers. So although the road number changes, the junction numbers are consistent when travelling from one side of the M62 to the other. You may be pleased to hear that Cherie Blair comments on the M52 in her autobiography "Cherie Blair: Speaking for Myself". "... hitch-hiking was the only answer, and in fact it proved so successful that from then on I hitched all over the country. When the M52 (as it was originally known) opened in 1973, I was among the first to benefit from it, standing on the slip road on that historic day with my thumb out, hitching a lift to Leeds." So there you go! Cherie was, of course, from Liverpool. Let's hope she was standing before the chopsticks sign when she hitched on that day.